I’ve been a bit lazy with this category, where I share my latest coffee bean experience with you – so I’m going to give you a snapshot of what I’ve been drinking over the last 2 months and promise to keep you up to date with my latest taste adventures. 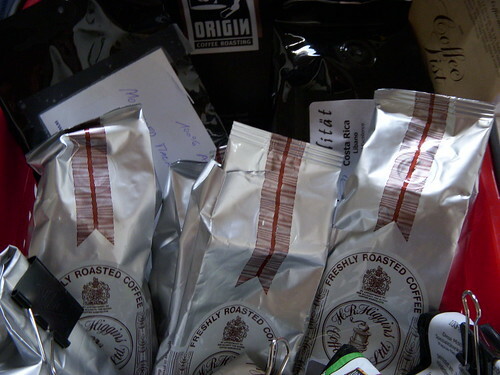 First up is a Rwandan Musasa, which I bought from Origins Coffee Roasting, Cape Town, back in February 2008. It was quite nice as an espresso, rich, dark and …. handsome (to the taste buds that is). I found it earthy/chocolatey and a smell of it, reminded me of Africa. So it was quite true to its name. I also got on that trip an Ethiopian Yirgacheffe as they didn’t have my favourite Ethiopian Sidamo. 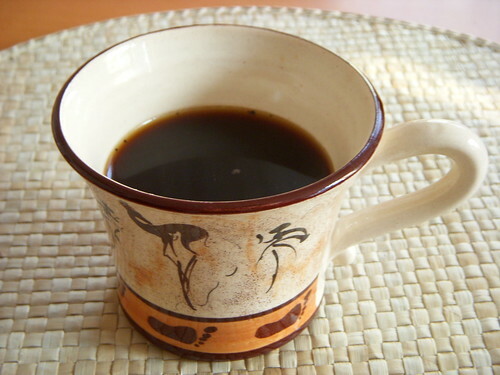 The Yirgacheffe was what I call typical African – bold and earthy, nice for Cafetiere and I couldn’t resist the temptation to make a portion in my bodum Cafetiere and shoot it in a newly bought “African” coffee cup, which I bought in Zimbabwe. 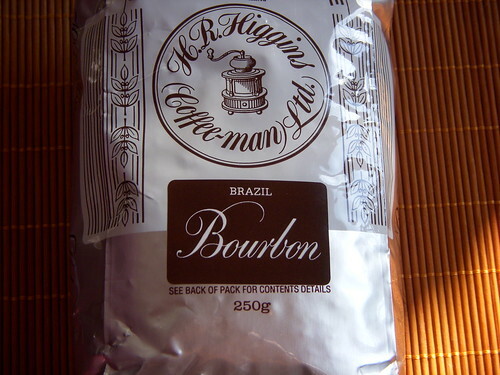 On my way back from that trip to Africa, I got to stop over in London and rushed on over to my favourite roaster, HR Higgins, where sadly enough they didn’t have Indian Malabar Monsooned but I was tempted to try their Brazilian Bourbon, which I can tell you has been added to my favourite list for espresso. Delightful ! It’s quite smooth as an espresso and has that Italian feel – I seem to recall reading somewhere that Italians use a lot of Brazilian arabica coffee beans in their espresso blends. As I usually drink espresso at night and wasn’t able to get a good shot of a rich and smooth espresso due to bad lighting, I can only share with you, a snapshot of the coffee bag below. In any case that basically summarizes the main highlights of my taste adventures for now. Of course I’ve also been drinking lots of other coffee but I just wanted to focus on the main discoveries. This entry was posted on Friday, April 11th, 2008 at 7:00 pm	and posted in Bean Talk - Coffees, I'm Drinking. You can follow any responses to this entry through the RSS 2.0 feed.